OpenSwitch is a Linux Foundation project providing an open source white box control plane running on a standard Linux distribution. The diagram above shows the OpenSwitch architecture. This article describes how to enable industry standard sFlow telemetry using the open source Host sFlow agent. The Host sFlow agent uses Control Plane Services (CPS) to configure sFlow instrumentation in the hardware and gather metrics. CPS in turn uses the Open Compute Project (OCP) Switch Abstraction Interface (SAI) as a vendor independent method of configuring the hardware. Hardware support for sFlow is a standard feature supported by Network Processing Unit (NPU) vendors (Barefoot, Broadcom, Cavium, Innovium, Intel, Marvell, Mellanox, etc.) and vendor neutral sFlow configuration is part of the SAI. Using the Host sFlow agent to monitor Linux servers and switches provides a consistent set of measurements end-to-end, particularly for cloud infrastructure such as OpenStack and Docker where the network extends into the servers in the form of virtual switches and routers. Visibility and the software defined data center describes the general architecture of sFlow monitoring. Standard sFlow agents embedded within the elements of the infrastructure stream essential performance metrics to management tools, ensuring that every resource in a dynamic cloud infrastructure is immediately detected and continuously monitored. The Host sFlow agent on OpenSwitch streams standard Linux performance statistics in addition to the interface counters and packet samples that you would typically get from a networking device. Note: Enhanced visibility into host performance is particularly important on open switch platforms since they may be running a number of user installed services that can stress the limited CPU, memory and IO resources. Note: The Linux host metrics (red), network interface counters (green), and packet sample information (blue) have been highlighted. Converting sFlow into PCAP format for use with tcpdump, Wireshark, etc. In addition to sflowtool, there are many other open source and commercial sFlow collectors listed on sFlow.org. 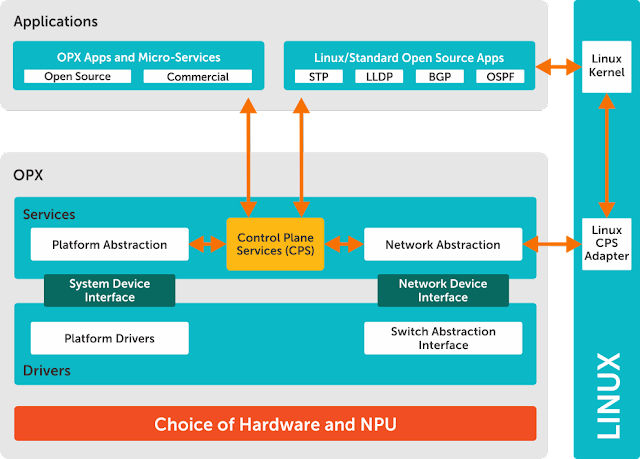 The programmability of an open Linux network operating system combined with real-time visibility is transformative, providing the foundation services necessary for solutions that automatically adapt the network to changing demands.